Improve discoverability of your online identity by displaying your ORCID iD as broadly as possible. Express your 16 digit ORCID iD as a URI. Have your ORCID iD printed on your Business Card. Email Signatory instructions: Your ORCID iD is displayed in RePortal as a result of your sign up. Copy the ORCID iD URL as displayed in RePortal (include the ORCID iD icon) and paste (hint: keep the source formatting so the link works) and save! If you're using Microsoft Outlook, open a new E-mail, select Signatures... [follow instructions above and save]. Use your ORCID iD in manuscript submission, grant applications & professional society memberships. ORCID doesn’t replace existing identifiers (Scopus Author ID, Researcher ID) or profiles (Staff web page, academia.edu, ResearchGate) but allows you to link them together by embedding your ORCID iD wherever possible. Authorise CrossRef (article DOIs) and DataCite (Dataset DOIs) to 'write' to your ORCID record automatically. Once authorised, CrossRef and DataCite will 'push' publication information to your ORCID record when you submit your ORCID iD during the manuscript submission process. Go to Check It for instructions. 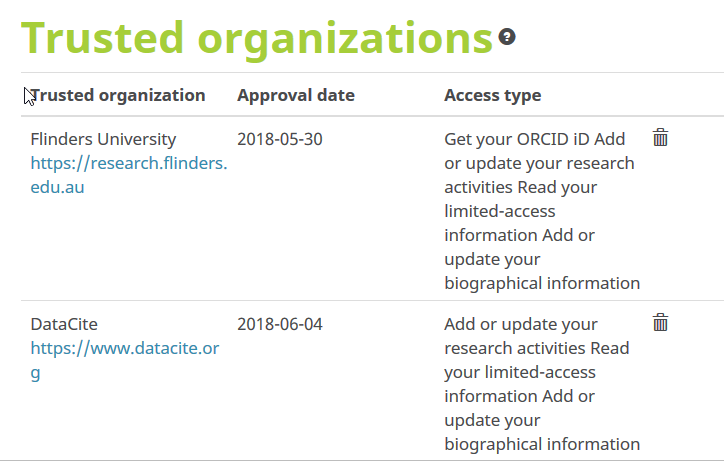 Flinders University will be pushing your institutional affiliation to your ORCID record in the future. Can't bear to wait? Update your record manually in ORCID. You can update your personal information by clicking the pencil icons next to the field you want to edit. Fields that can have multiple entries will display a plus sign to add more information. You can edit how your name appears on your ORCID record by clicking the pencil icon next to your name. The Published name field is the one that displays at the top of your ORCID record. The Also know as field can be used to record other names you go by and other versions of you name. For more about names see Names in the ORCID Registry. Adding additional names you are known by helps identify you. Click on the pencil icon next to your name to edit the name you registered with and enter a published name that will be included at the top of your ORCID record. Or click on the pencil icon next to Also known as to enter other names you have used, such as including your middle name, married names, and names in different character sets. Find out more. The biography field can be used to provide a brief description of your professional career. It is limited to 1000 characters and can only be in plain text. This field is a drop down list where you can select the country you currently work in. Keywords are any words or phrases that describe your research activities and might help someone identify you. Multiple keywords can be entered, up to 256 characters total. Your ORCID record can be linked to multiple external webpages such as a personal website, department profile, Wikipedia page, or social media accounts such as Twitter, LinkedIn, Facebook, Google+, and others. Under the Website section, enter information about the website into the Description and URL boxes. Enter a description of the website. This description is displayed as part of your record and should be kept brief. Enter the full URL of the website you want to link to. Saved websites display with the just the description, which links to the URL you provided. You can add an unlimited number of websites but each must have a unique URL, websites with the same URL as a previously added website will not save. Do you have administrative staff who manage your publications on your behalf? You can grant permission to another ORCID user to update your ORCID record on your behalf. You can revoke this permission at any time by visiting the account settings page.To grant access to a trusted individual (delegate) go to the Account Setting tab when you are logged into your ORCID record. Under Account Settings, scroll down to the Trusted individuals section. In the search box, enter the ORCID iD, e-mail address, or name of the person you want to make a trusted individual then click search. If you enter an email address or ORCID iD, a pop-up box will ask you to confirm adding that user as a trusted individual, click Add. A user must have an ORCID iD before you can make them a trusted individual. If you search for a trusted individual by name, a list of matching ORCID records will be listed. Click on the Add button next to the name of the user you wish to make a trusted individual, or click on the user's name to be taken to their ORCID record. If a user is already a trusted individual on your account you can click the trash can icon to remove them. After you have added a trusted individual to your ORCID record, their name and ORCID iD will appear under the Trusted Individual section. To remove a trusted individual from your account click the trash can icon next to the person you wish to remove. 1. Sign into your ORCID account, you will see a tab for Account settings at the top of the screen. 2. Click Account settings and scroll down to the Trusted Organizations section. To revoke permission simply select the Trash can icon and select confirm. In order to write content to another person's ORCID profile, you must recieve delegated write access through the trusted individuals permisions. Please see 'delegate write access of your ORCID profile' for detailed instructions. Once you have received 'Trusted individual' status, you may write the person's ORCID iD. To write to this profile first log in to your own ORCID account and then select 'Switch Account'. Select Researcher and start adding to the profile. See Update your Profile for instructions. Who can see your ORCID record? Anyone can see your ORCID record. By default, with the exception of your email address, information in your ORCID record is publicly available. However, only your name and ORCID ID must be publicly available. You control access to any other information you add to your ORCID record. You can choose among three levels of security: Public (anyone can see it); Limited (you authorize Trusted Parties to see it); and Private (only you can see it.) Simply login to ORCID and use the icons to the right of each item in your record to set the access control you want. Flinders University recommends you follow the default ORCID privacy settings.